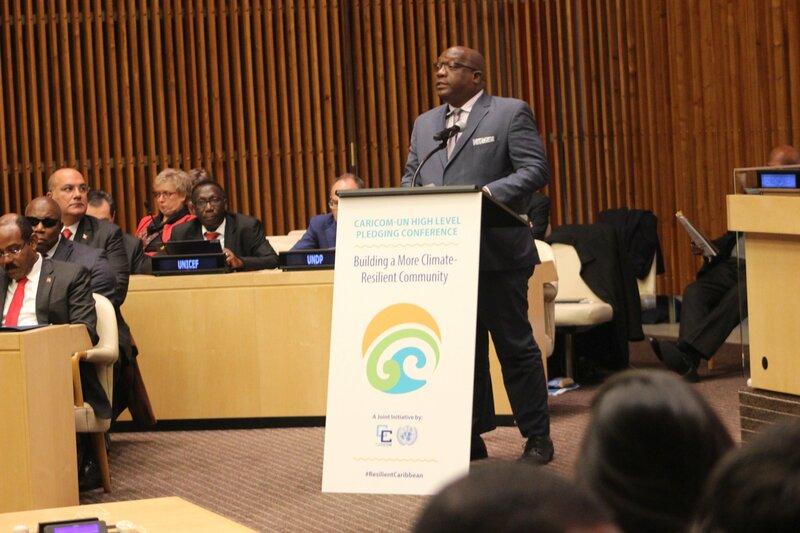 BASSETERRE, ST. KITTS, NOVEMBER 22ND, 2017 (PRESS SEC) – St. Kitts and Nevis’ Prime Minister, Dr. the Honourable Timothy Harris, presented his country’s vision for the level of climate resilience and support required to achieve the 2030 Sustainable Development Goals (SDGs) at yesterday’s CARICOM-UN High-Level Pledging Conference. Dr. Harris was making reference to the $2.5 million in hurricane relief aid that St. Kitts and Nevis has given to several affected islands this year, in addition to in-kind support and services, such as free school enrollment for transfer students. As for “helping ourselves,” Prime Minister Harris’ administration quickly introduced a Farmers Recovery Support Fund and a Hurricane Relief Duty-Free Concessions Program to assist homeowners whose residences were damaged by the hurricanes. The Prime Minister of St. Kitts and Nevis discussed the key challenge of financing, arguing that the per capita income approach, which is a significant criterion used in development cooperation funding, is an impediment to Small Island Developing States (SIDS) in securing concessional funding. “St. Kitts and Nevis like Antigua and Barbuda, having been classified as a high-income country, is not eligible for concessional funding. Therefore, we have been relying on the use of our own resources to bring the country to a level of satisfactory recovery. However, there is much more to be done, and as a Small Island Developing State the demands on our limited resources are substantial and create fiscal pressures as we strive to continue the implementation of our development agenda,” the Honourable Prime Minister said. “In the latter half of the 1990s, the Federation of St. Kitts and Nevis experienced several successive hurricanes. However, due to lack of access to concessionary funding and policy failures, we had to incur debt on commercial terms, which resulted in St. Kitts and Nevis being classified as the most indebted country in the world. Through the significant sacrifice of our people and the implementation of an IMF austerity home-grown program, we are reducing our debt to a more manageable level,” Dr. Harris said.